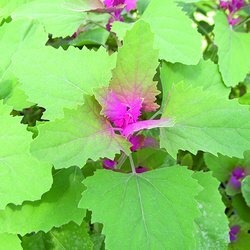 Tree spinach is a must in your garden if you like a bit of colour&comma; the growing tip is a stunning bright pink&comma; and as the leaves grow they turn to green. This is actually classed as a vegetable and is part of the spinach family but as it grows so large we supply it in the herb pots to give them more room. Tree Spinach can be used like normal spinach&comma; young leaves can be eaten raw and added to salads or cooked&comma; and older leaves can be cooked. Once the plant has established. Pinch out the growing tips to encourage it to bush out.